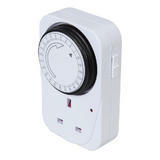 Timers and controllers are available for a wide range of applications. 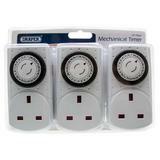 Typically we would use them to turn off an appliance at a set temperature or time. More often than not this is to help us save money on heating or electricity costs. With the high current cost of electricity a typical immersion heater timer can quickly save enough money to pay for itself. It is important though to buy the right one for your specific needs. 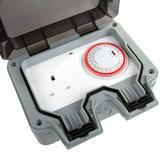 For example in the case of a heater timer you need to understand the current rating required. For a 3kW (3,000W) heater connected to the nominal UK mains voltage of 230V the timer switch must be able to handle 13 Amps (3,000/230). A timer with a smaller rating would very quickly fail. Another example would be whether you want to use the timer for different times on some days of the week - it is common to have different needs at the weekend than you would during the week. Another common requirement is for a timer which can simply plug into a normal mains socket or alternatively one which is fitted to a back box making a neat installation. All these different aspects can be confusing and we are here to help you. We have a wide range of timers and controllers available to order today, if you need advice please contact us and we will try our best to help.